As I'm thinking of going with a modern design for these cards (almost LCARS in nature) this will be a science fiction duel between two players (not sure how it could work with multiple players yet). Each player represents a warrior with an energy sword and a force shield (insert backstory to fit your favourite franchise or setting). Players take turns to attack or defend depending on who currently has the initiative. Initiative swaps between players based on choices of attacks and defence. 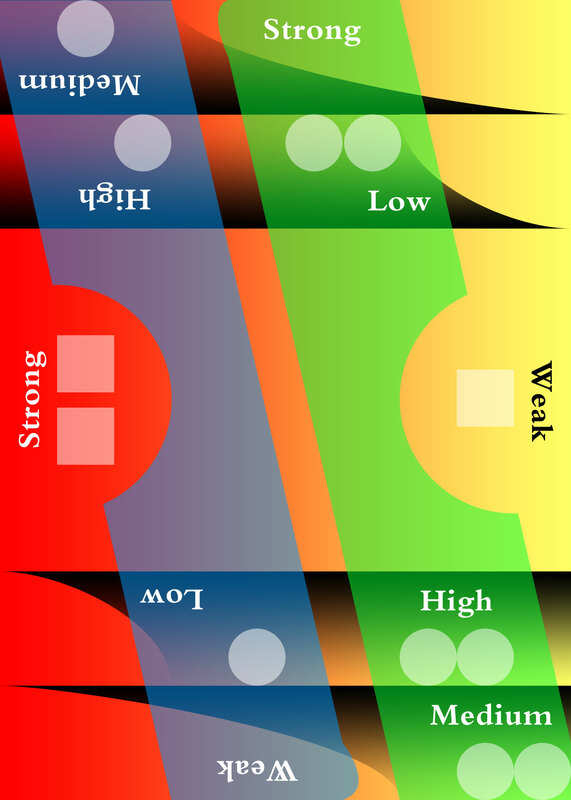 Gameplay consists of playing one or two cards (of a deck of 2 cards) and marking the backs with any damage taken. No downloads yet, as I've only done interim card designs. When I've done some nice colour ones, then I'll put them here. Each player takes both their cards. A whiteboard marker is given to one player to mark damage and signify that they have the initiative. Mark any damage on one or two (depending on the strength of the attack) of the circles on the back of either card. If you have six damage circles marked (either all on one card, or distributed amongst the two cards), you lose. Play continues with the player who has the initiative always playing second - until one player has 6 circles marked with damage. If a circle is marked, you may not place a card on top of it. e.g. if you have three marked on the attack card, you can no longer thrust or parry. If 6 circles are marked in total on your cards, you lose.